The Super Soaker Thunder Storm is one of the new models released for 2011 by Hasbro Inc. It is the first a motorized water blaster under the Super Soaker brand name and features swappable magazines a.k.a. Nerf Super Soaker Clip System Canisters. It is almost ironic to see a motorized blaster under the Super Soaker brand as, back in the early 1990s, it was the original Super Soakers that put the then dominant motorized water gun market to shame. However, while it may be "Super Soaker" branded, its performance leaves much to be desired even for a motorized blaster. The Nerf Super Soaker Thunderstorm features a rather small nozzle opening. Streams pushed out by this blaster are rather thin, indeed, and begin to break apart roughly 10 to 12 feet after exiting the nozzle. Output is, unsurprisingly, very low as well, being much less than the 2007 Water Warriors Tarantula. In fact, even the Nerf Super Soaker Point Break can outperform this model, though the Thunderstorm does offer a slightly larger reservoir capacity. As already noted, the Nerf Super Soaker Thunderstorm uses a motorized pump. The motor drives a peristaltic pump to push water through the internal tubing and out the nozzle and is powered by 4 AA batteries, activated simply by pulling the trigger; there is no on/off switch on the blaster, itself. When activated, the pump is somewhat noisy and would definitely blow one's cover if one were previously hidden. 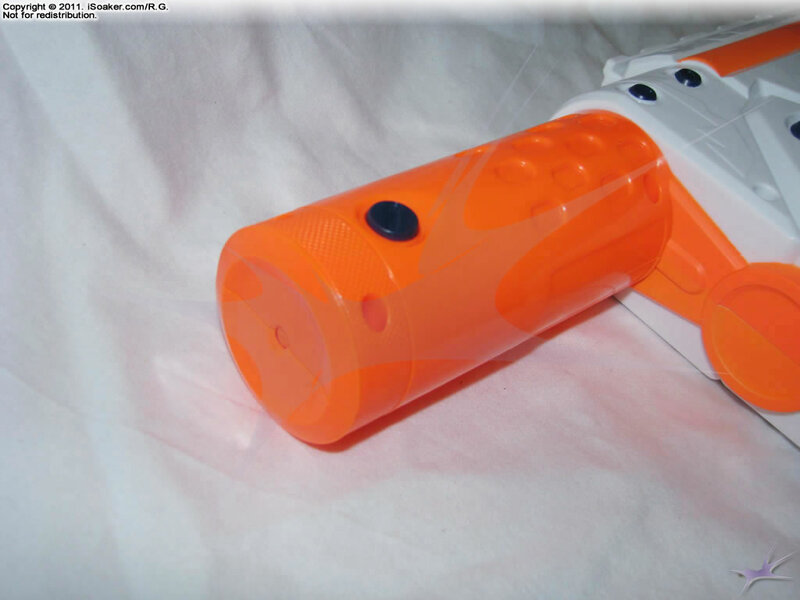 The pump is completely enclosed in the blaster's body and the battery chamber is sealed with a rubber gasket which should keep the electronics dry during a water fight, though it is probably not recommendable to fully submerge this blaster. 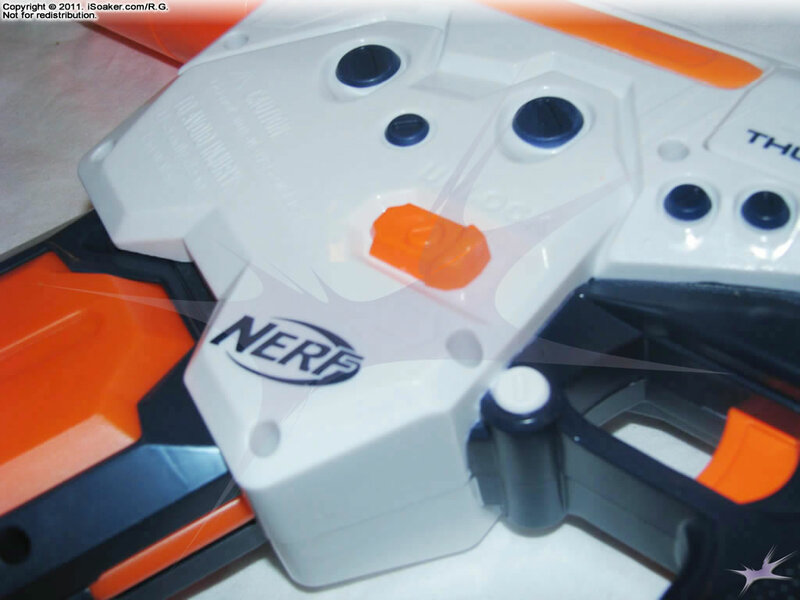 The trigger and grip area on the Nerf Super Soaker Thunderstorm, like the rest of the blaster, is well moulded and very comfortable to hold. It appears that Hasbro Inc. spent a good amount of time refining their triggers and grips for the entire 2011 Nerf Super Soaker line. There even appears to be a place where a strap could be tethered through, though the blaster does not come with a strap. The Thunderstorm also features a tactical rail so accessories can be attached as well as a point at the back where a shoulder stock can be mounted. 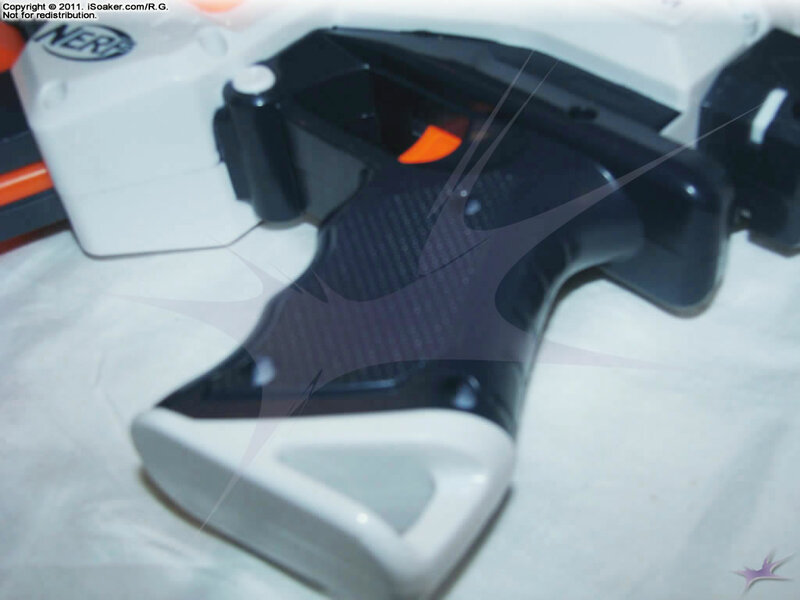 There are some reports of Thunderstorm packages sold that include a shoulder stock, but this particular package came with only the blaster and magazine. 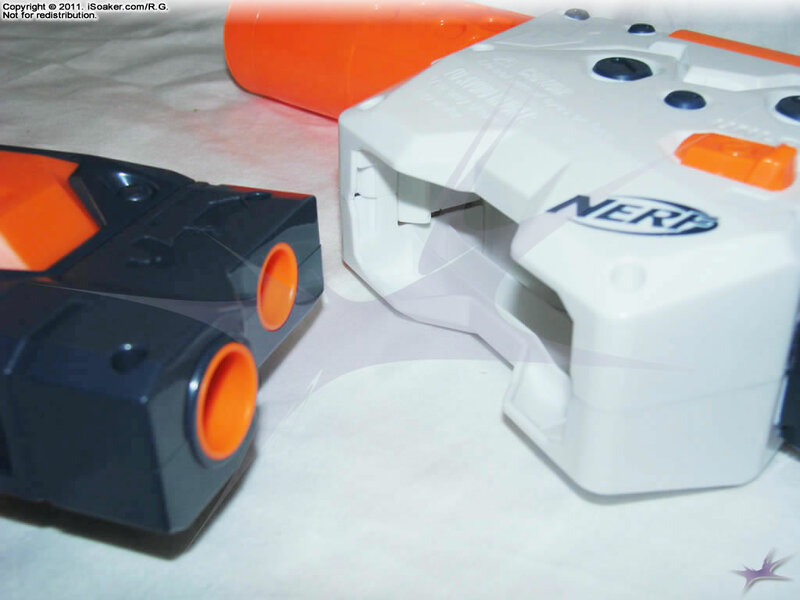 Like the Nerf Super Soaker Tornado Strike, the Nerf Super Soaker Thunderstorm makes use of Nerf Super Soaker Clip System Canisters for its water reservoir. This adds to the look and role-playing elements to this blaster and, of course, allows a user to carry around multiple clips for additional water on the field. However, the amount of water held in each clip is not that much, thus this blaster's soaking potential per clip is limited. Granted, due to this blaster's low output, a full clip does offer over 30 seconds of continuous shot time (not that one should typically need to shoot continuously for 30 seconds). As a whole, the Nerf Super Soaker Thunderstorm is a well-built, nicely-styled water blaster, but lacking in power and capacity. Its usefulness in the water warfare field is rather hampered by its low range and output. The ability to add on accessories is a nice, novelty feature, but does not add to its performance. Be wary if facing off against any true pressurized water blaster or any piston blaster of similar size or larger. Output and range rather low for a blaster of this size. Magazine capacity not very large. Motor is rather noisy when activated. Requires 4AA batteries to work. I borrowed this from a friend for a single round so I could write a review from a combat perspective this is what I found. Quality I would describe this blaster's body as almost unbreakable, The internals however are another story. I have heard people online say that the Thunderstorm is busted if you ever submerge it, and a look at reviews on Amazon tells you that an unacceptable number of these blasters are DOA (dead on arrival). Combat In less than a minute a WW Avenger made me switch roles to using the T-Storm as a backup where it proved equally poor, only squirt guns need (barely) fear this thing. I picked a couple of these up the other day so my 3 year old niece could use a squirt gun, the gun is pretty unimpressive you can soak someone if you can continuously spray them for about 20 second, that is to say not very fast. the little kids love them though, it's easy on little arms and with preloading and bucket filling I can keep em going a long time. However they seem to enjoy the gargoyle about the same and are much more dangerous with it. Normally I'd never buy a gun like this, but I found one at Goodwill for $2, so I thought I might as well. Here's a quick review. This gun has a very nice grip and looks cool, appearing to be based off the real life Skorpion submachine gun. However, the stream is extremely weak, thin, and slow. I've had dollar store pistols that can put out way more power than this. And of course the magazine system holds hardly any water. Overall, it's an interesting and fun little gun, but it's completely useless in water fights.